On small plastic boxes, are sometimes found, hinges that snap into place to allow easy assembly. They are made with two balls attached to the lid and a disc with dimples in each side attached to the bottom of the box. The lid snaps on and then can swivel as the balls slide in the indentations in the disc. While metal does not have the flexibility that plastic does. A version of this hinge can be built where the spheres are pinched slightly together after inserting the indented disc. Such a hinge can come apart if pulled on hard enough but will function well if there is little stress on it. 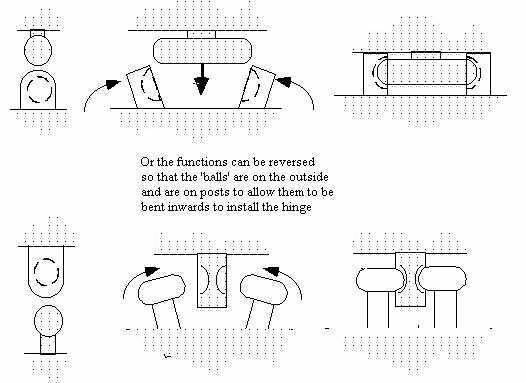 One can reverse the positions of the rounded parts by having the central ‘knuckle’ have rounded ends and be installed in sturdy tabs with rounded indentations on the other side of the hinge. It is designed so that they are open enough to just squeeze in the middle ‘knuckle’ and then are closed over its rounded ends to install the hinge. Since we defined a hinge as involving rotation of parts relative to each other at a fixed point somewhere back in the beginning there are a number of other kinds of solutions which satisfy this definition. Examples of this include coil bindings on notebooks, sewing through holes in the material, glued or mechanically fixed cloth or woven materials, mesh use and all sorts of chains and jump ring based flexible systems. An example of how this kind of thinking is applied can be seen in this design sent to me by Phil Porier. He has used a hinge pin just shorter than the hinge itself on each side and then tube set faceted round gems into the ends of the hinge. I might recommend starting with the outer knuckles a little wider than the width being hinged: this to allow for metal removal during setting.